It's actually very odd with all the recent I's that are retired that H has not been retired in 20 years. Nowadays to get an A storm retired, it seems that you need a really quiet season or a major flood disaster. Even Andrew (1992) would not have been named such had current naming procedures and reanalyses been in place. Hanna from 2008 would have been the best shot for an H storm to be retired. But of course Haiti did not make a request. And on another note, there was an unnamed tropical storm from 1988, that formed before Gilbert, meaning that if it had been detacted, Gilbert would have been Helene instead (and Joan would have been Keith). Gilbert could have still been retired in 1994 if Haiti actually filed for retirement and Gordon could have still been the replacement for 2000. And Kirk would have been retired in 2000 as well had that unnamed storm been detacted and named. Lately, Youtuber ForceThirteen has been doing tracks for what-might-have-been Hurricane Seasons, 1979 to present. It's actually pretty interesting. So far, he's done up to 1993. Some of the seasons are very interesting so far. So here are things to note. - There were some subtropical storms that had formed in some seasons. Obviously, one of them from the 1992 season. Andrew would have been named Bonnie instead. There was also a subtropical storm in 1990 that later became tropical, thus Edouard. And it formed before Diana, which meant in modern naming, Diana would have been named first and Diana would have instead been Edouard. So far no 2016 names look headed for the dustbin, but if models are right, Matthew (or Nicole if something forms fast) could be a candidate. HurricaneRyan wrote: Lately, Youtuber ForceThirteen has been doing tracks for what-might-have-been Hurricane Seasons, 1979 to present. It's actually pretty interesting. Another factor that could change names is if they are found in reanalysis to be a tropical storm sooner than currently analyzed, which could shift their order down. Also (before 2002) if they were subtropical first, they would get the name sooner, hence some would change order. Another thing I noticed in his videos, is that Bob from 1991 would have actually been Claudette. And Bret in 1993 would actually been Cindy as a Category 3 hurricane. And both Claudette and Cindy would have been retired. Personally, I always thought Bret had a warrant for retirement due to the death total. But a hurricane at the time would have been more believable. CrazyC83 wrote: So far no 2016 names look headed for the dustbin, but if models are right, Matthew (or Nicole if something forms fast) could be a candidate. Are you sure? I'd think Earl would have a decent shot at retirement due its deaths, and maybe Hermine due to the ~$500 million in damage it caused. I'd give Earl about a 30% chance (maybe on the death toll) and Hermine a fairly low chance since 500M is not exceptional in the US these days. Matthew is definitely getting retired now, so M will have four retired names. Two of them being the replacements for their originals. Saw a Facebook post by Brian McNoldy yesterday on retired names. Thought it was interesting to see it graphically. Note that Brian has 6 "G" storms retired, not 4. Interesting that most "G" storms were retired in years ending in 8. Does that mean Gordon is likely to be retired this year? I checked with Brian McNoldy - he lists Gracie as being retired in 1959, but NOAA doesn't list it as being retired. I'll count how many names per each letter in the morning, but it's pretty interesting I think. I've updated my hypothetical with the seasons from 1900 to present of retired names if 99% of storms were named operationally and the modern naming list had been used each time. Last edited by HurricaneRyan on Mon Apr 16, 2018 11:23 pm, edited 1 time in total. I believe that there are seven storms that should have been retired from usage. Thanks everyone for the research. I would have guessed I, C surprised me though. I would like to know if high number of “C’s” was because of early season storms or late season starts? OuterBanker wrote: Thanks everyone for the research. I would have guessed I, C surprised me though. 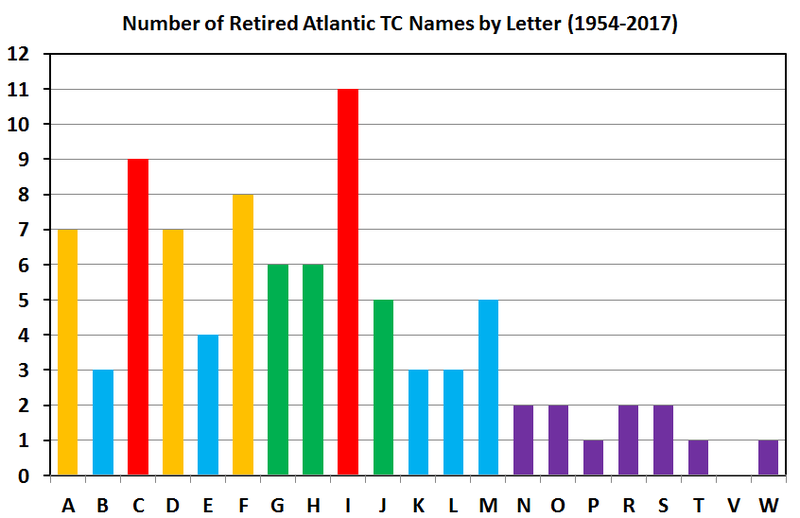 7 of the 9 "C" names that were retired came before 1979, when male names were added to the lists. No female "C" names have ever been retired since then. Only 2 of the 11 retired "I" names (Ione and Inez) came before 1979. The 1970s were the lowest point of the "Multidecadal Oscillation." Subtropical storms have only received names since 2002. With satellites and other instruments becoming ever more sophisticated, any tropical system where sustained winds reach the criterion for getting a name for even a few hours is now probably being named, where many of those minimal short-lived tropical storms might have been missed before. The three factors above combine to mean that the most severe hurricanes, those most likely to have their names retired if they hit land, were likely to have names starting with "C" in the early decades of hurricane naming, while in the last three decades with the increase in the total number of named storms, the peak of intensity is more likely to occur around "I". I think better satellite and recon data hurts the chances that earlier storms end up retired. For example, two tropical depressions in 1985 for all we know could have briefly ended up named today. If so, Hurricane "Gloria" would have been "Isabel". In 1992, if the subtropical storm in April had been named, Hurricane "Andrew" would have been "Bonnie", and had the other two depressions prior to Andrew been named, Andrew would have been Hurricane Danielle.